The Winnower | Did Elephant sharks forget evolution? The fish swimming in our oceans are more complex and diverse than many would assume. They are the first true vertebrates, but have subsequently divided into many different groups, with the first split being between Jawed (Gnathostomata) and Jawless vertebrates (Agnatha). Jawless vertebrates are animals like lampreys and hagfishes, and Jawed vertebrates are, well, everything else. 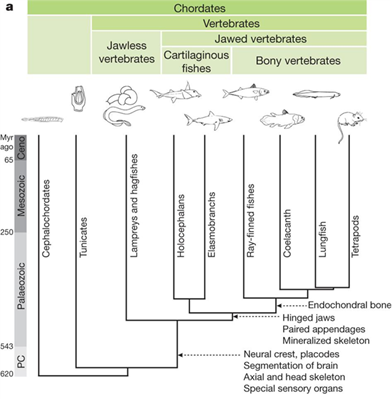 Jawed vertebrates have been around for 480 million years, but went through another major split, separating into the Teleosts, fish with a bony skeleton, and Chondrichthyes, that have a cartilaginous skeleton. This latest group contains the Elephant shark (Callorhinchus milii), a species that recently gave new insights on evolution. They belong to the most ancient subgroup of the Cartilaginous fishes, the Holocephalans, and therefore aren't actually sharks. They can be found off the coasts of Australia and New Zealand, where they are apparently a very popular snack. 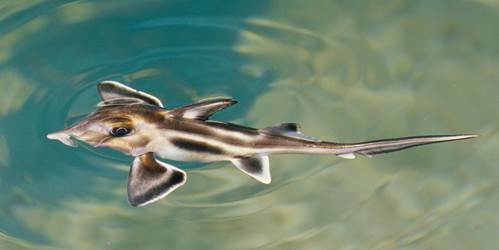 Image: An Elephant shark (Callorhinchus milii). They have a cartilaginous skeleton everywhere except for their jaw and teeth. An international study conducted by B. Venkatesh et al in 2014, sequenced the Elephant shark DNA and compared it to changes in several other vertebrates, such as: humans, chickens, lizards, and zebrafish, in order to look at its characteristics. This study aimed to discover the beginning of vertebrate evolution by examining its basal group. What this study actually found was the slowest evolving vertebrate ever, even when compared to our resident living fossil: the coelacanth. This is quite a feat, meaning that over the past 410 million years Elephant sharks have changed less than a species that was thought to have gone extinct over 66 million years ago. The discovery was made by looking at different changes in the DNA, such as how quickly mutations occur. Another important finding was in its primordial immune system: basically, adaptive immunity 1.0. The adaptive immune system is found exclusively in vertebrates, and is responsible for the production of T and B cells, that allow for immune memory. By comparing the Elephant shark genome to that of a zebrafish, it was possible to analyse how bone formation is developed and which genes control it. They found the gene family responsible for bones in other vertebrates by looking at the impact of removing them in embryos of bony fish. This caused reduced bone formation in zebrafish. This study has given a new insight to the way we look at evolution, influencing how evolutionary rates are considered and different reactions to similar selective pressures. Having a basal genome to compare vertebrates with can give a better understanding to how different we really all are to each other. Knowing what the beginnings of the adaptive immune system look like can help us determine workarounds for people with deficient immune systems and finding the gene family responsible for bone formation can help improve research for genetic bone diseases. All in all this massive international effort ended in massive success.